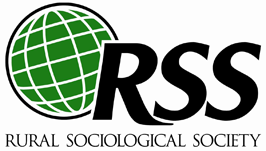 The RSS is a professional social science association that promotes the generation, application, and dissemination of sociological knowledge. The Society seeks to enhance the quality of rural life, communities, and the environment. This website is intended to serve all those interested in rural people and places. We seek and support a diverse and international membership of academics and practitioners who share our interests in rural people and places. The core activities of the Rural Sociological Society are our peer-reviewed journal, Rural Sociology, our annual conference, and support for communities of scholars concerned with specific rural topics. Through these activities, the RSS has provided leadership in scholarship, policies, and advocacy. Since its founding in 1937, the RSS has traced changes in rural life and livelihoods, demography, community structures and economies, technologies, environmental conditions, and agriculture and food systems. In these politically turbulent times we wish to share with others the core values that we believe animate and organize our activities as members and leaders of the Rural Sociological Society (RSS). We believe in the free expression of ideas, in civil discourse and mutual respect among participants, and in the value of scientific research without political considerations. We oppose actions and words that demean, exclude, and otherwise marginalize individuals and groups of different genders, races, identities, sexual orientations, and national origins. We seek to assist vulnerable and marginalized peoples wherever they may be. Why RSS? RSS offers multiple opportunities to interact with others who share your interests in rural places both in the United States and internationally. We have fourteen Research and Interest Groups. RSS keeps you informed of professional opportunities via our website and monthly eBulletin. A subscription to our journal Rural Sociology is included with your membership. RSS members receive a discounted registration rate to our Annual Meeting (held late July or August each year). RSS members take an active part in the program of the annual meeting by submitting posters, papers, panels, and organized sessions. RSS offers leadership opportunities. RSS currently has 14 RIGs.